In the dog-eat-dog world of Internet service providers, many companies in the space offer extra features to lure customers away from the competition. Comcast — one of the largest media companies in the world — is no exception. The company provides their own Comcast speed test to both subscribers and the public, branded as the Speed Test from XFINITY. This Flash-based speed test uses the same technology as a popular speed test company. After choosing the closest Comcast server to your current location, you simply click on a button to start the test. The test pings the server and performs a quick download and upload of a small data file to verify the speed of your Internet connection. After the test completes, you have the option to save an image of the test results or you can save the URL to the image itself on Comcast’s servers. Maintaining a history of your test results is vital should your Internet bandwidth be less than what your ISP promised. Having this data makes it easier to get a refund if necessary. One problem with Flash-based Internet speed tests is Flash itself. It is an older, proprietary technology that has become quite buggy in recent years. 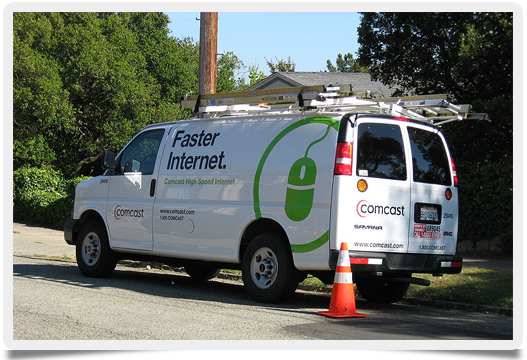 If you find that you can’t perform a Comcast speed test due to the Flash plug-in crashing, restarting your web browser usually clears the problem. If you want to perform a speed test on your iPad or PlayStation 4, a Flash-based test is not an option since Flash isn’t compatible with those devices. Leveraging a state of the art HTML 5 speed test is the way to go when using a mobile device or video game console. The tests work the same way; testing a quick download and upload of a file to verify your Internet speed. As always, when performing any kind of Internet speed test, be sure to save your test results should you need them in the future for reference, or to get a refund.